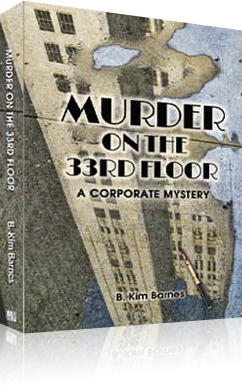 Did you really think of yourself as a "corporate Nancy Drew?" Why? I did. Nancy (along with Wonder Woman) was really an avatar for me as a young girl. I liked her curiosity, courage, and determination; her willingness to follow the clues wherever they would lead. She was not impressed with nor intimidated by power - nor did she seek to gain power over others. She just wanted to solve the mystery and restore things to equilibrium or better. I was never particularly good at managing the politics in any organization I was a part of; I found that I could add the most value by being "in it , but not of it." I focused on using my curiosity and persistence to clarify, untangle, and help resolve issues that were getting in the way of individual, team, or organizational success. Is Sarah based on you or anyone you know? An old friend who recently read a pre-launch copy wrote, "I sensed a portion of you in many places in the book." I suppose that's true. I didn't deliberately base Sarah on any specific person, including myself, but those of us who are attracted to organization development consulting probably have a number of characteristics in common. I have often discussed this with friends and colleagues and we usually agree that we share these qualities: curiosity, independence, a preference for being toward the edge rather than fully inside of any group. Which is more difficult to write - fiction or nonfiction? It may be different for different people, but for me, fiction is at the moment more challenging and more fun. I suppose that is at least partly because it is new for me - or at least, I haven't done it for the past 50 years or so. They say that it's good for your brain to learn a new language as you age. Fiction is that new language for me. When you wrte nonfiction, you are fairly free to organize it in the way that you think will get your key points across best. You can use stories, interviews, exposition, research results, or other means. You can start with a premise and then illustrate it; you can start with examples or research and lead up to a solution or conclusion. With fiction, you need to attend to several different elements. According to Elizabeth George, in her excellent book, Write On, you begin with the setting, then develop the characters and the plot. Most writers on writing suggest that you follow a structure similar to a three-act play or a metaphor such as the hero's journey. The setting must be interesting and appropriate to the story. The characters must be believable and at least one of them should be sympathetic. The plot should be credible, given the premises. All of this has to work together. It's a puzzle, but a fascinating one! That said, I am now working on another business book - but I think it has been informed by what i am learning from and about writing fiction. Why did you decide to write a mystery novel? As an author or co-author of a couple of business books and many chapters, articles, and white papers on professional topics, I am sometimes asked, "Whatever made you want to write a detective story?" I suppose I could answer the question in a number of different ways, but the main reason, as you can see in my short bio, is that I have always thought of myself as a Nancy Drew wannabe – she was my avatar. How the book came to be? Beverly Scott and I had just finished working on our book, Consulting on the Inside, for ASTD Press. I had really enjoyed the process of writing this book and doing so brought back many memories of my own experiences as an internal consultant. At the same time, my travel schedule really heated up and I had a number of flights that were 10 - 12 hours in length. On one flight, I was unable to sleep and had finished the work I had planned to do. Suddenly I found myself beginning to write a story. I had started a mystery about twenty years before, but the work disappeared into cyberspace when I changed computers and I had quite forgotten what it was about. I did remember that the protagonist was an OD consultant and had a husband and a "sidekick" friend with whom she could discuss what was happening. I just began to write. The story flowed out almost as if it were telling me rather than that I was writing it. That continued through several trips. I found that I really looked forward to finding out what happened next! Of course, that became a problem about two-thirds of the way through, when I still didn't know "whodunit!" Once the plot revealed itself to me, I could see where I had left clues to myself, but it was all going on outside of my conscius awareness. I guess that's the curse of being an extravert. I did decide to plot the next one in advance just to lower the stress level and have done so. Both Bev and I have begun writing fiction since we finished the book. We've formed a witing group and continue to enjoy reading one another's work, critiquing and supporting one another. I am also working on a new professional book and am enjoying the balance.